The tiny settlement of Berridale calls itself ‘Crossroads of the Snowy’ because, when miners were making their way to the goldfields at Adaminaby and Kiandra from the port at Twofold Bay, they passed through Berridale. Today it is a small service town which, by an accident of history, lies conveniently between Cooma and the snowfields of Thredbo and Perisher Valley. Consequently each winter it becomes a popular stopover point for thousands of people who are heading to the snowfields. Located 436 km southwest of Sydney and 35 km from Cooma it has a population of 800 and is 860 metres above sea level (ie. below the snow line). It is a small township with a winery, a small shopping centre and the Snowy River Shire Council Offices. As a wit in Jindabyne observed: ‘Berridale is the sort of town where if you blink you’ll miss it but if you roar through you’ll remember it forever because you’ll probably get booked for exceeding the 60 km speed limit. Berridale was first settled in the early 1860s when William Oliver selected land in the area. He built a house in 1863 which subsequently became a wayside inn. The site of the original building is now Berridale Inn on the Jindabyne Road. Oliver named the town after his home in Scotland. The area grew slowly and although the SMA established a work camp in the town there is little evidence of SMA housing. 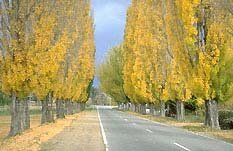 The chief attractions of the town are the poplar drive (on the Jindabyne side of town) which, in autumn, boasts one of the finest stands of yellowing poplars anywhere in the Snowy Mountains and the old schoolhouse in Oliver Street which dates from 1883 and is listed by the National Trust. Although the buildings have had extensions they still are a reminder of what a small country school was like at the end of the nineteenth century. Of particular interest is the gabled roof and the unusual curved corrugated iron roof. They are actually two buildings which have been joined by the inevitable pragmatic extension. The town also boasts a winery which is actually located on the Snowy River and must be one of the highest vineyards in Australia. Open from 10.00 a.m. – 5.00 p.m. daily it sells wines as well as offering teas and lunches. 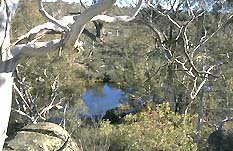 Its setting, amongst the granite rocks on the banks of the upper limits of the Snowy River, make it one of the most attractive destinations in the district. To sit in front of the open fire in winter and enjoy a good meal is a delightful way to spend a few hours.